We are sending out the Renew Newsletter earlier this week so that you can make time for a special webinar. It will focus on two of the seven key elements of renewal - Surrendering to Jesus (#3) and Loving Like Jesus(#5). Join us this week on Thursday, September 27th at 8pm CT for our webinar How should you respond to men and women who are transgender? We will share the powerful story of Brandon Redler. Brandon is a Christian man serving with the Strength in Weakness ministries. For as long as Brandon could remember he wanted badly to present himself to the world as a woman. At 16 he began living as a woman. Come and hear the story of Brandon and how a man who lived as a woman for 6 years could be embraced by the church. Hear how the teachings of Jesus renewed Brandon so that he could be baptized and begin living as the man God created. We will discuss many questions surrounding the topic of transgender and provide ways that those trusting and following Jesus can respond with love. 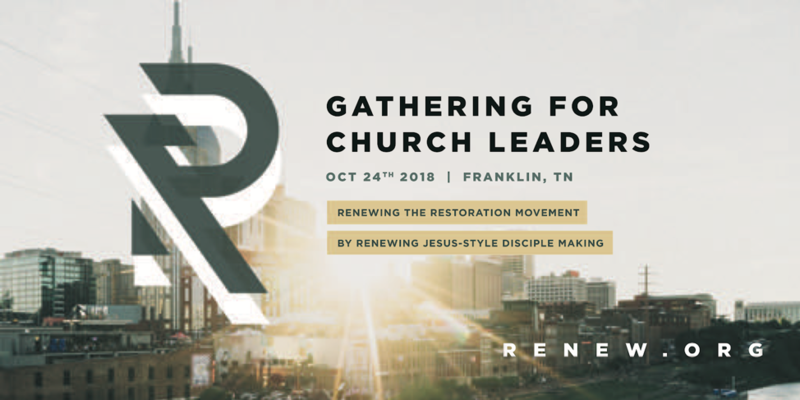 PS - We are still offering a lower rate through next week to the Renew Network’s Church Leader Gathering in Franklin, TN on October 24th. Brandon and others will speak on the 7 elements of renewal. You don't want to miss it! More info here.